this is a bit late as there was no internet reception at Boort, in fact the signal was very weak so I am doing this from Kerang. The rest day at Wedderburn was great, very relaxing. We toke a small walk around the reservoir which was at the back of the campground. I would imagine the reservoir would be very nice in the hot weather that they can get up here, but when we walked around it somehow I don't think it was very inviting ... a wee bit too murky for me! The Wedderburn campground is really nice and I highly recommend it - cheap and clean with all the facilities a cyclist needs but can't carry on the bike! Also opposite the office is a little hut with a great deal of history. Originally it was at the back of the reservoir and in 1983 it was moved to its current location in the caravan park. The hut was built by an 11 year boy (with guidance from adults) and he built it for some woman called Nancy Stokes who previously lived in a make shift tent that was patched together and the little boy thought that this woman couldn't live in the tent like that. So between the 2 they built this hut and she lived in it until 1979 (which is only 31 years ago!) and she was 93 years old! Marvellous story it was! So the ride to Boort was relatively uneventful, we had to wait for dad for a long time while he got himself packed up. Below you will see a photo of Neil and we have titled it "the waiting for dad pose" LOL!!!! 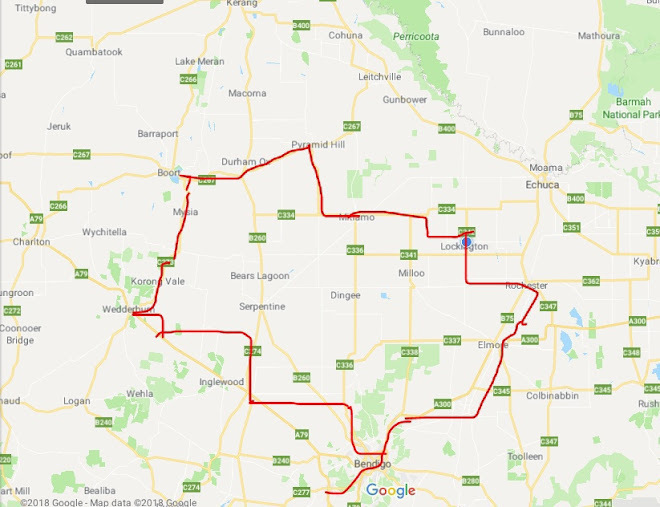 So we knew the ride to Boort was going to be easy - flat and a raging tailwind! And dad was very happy with the cycling today! 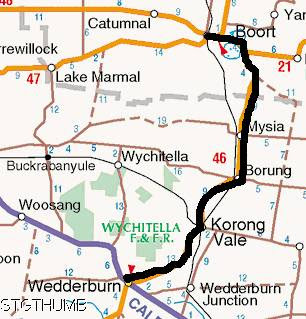 We got to Boort around lunchtime and it did cross our minds to continue another 51km to Kerang since the wind was so strong, but I think that would be pushing it for dad! I don't know why but today while cycling we stopped at a place called Korong Vale and neil took this photo of this building so I have put it up here on the blog just for him! I must admit there are some really lovely old buildings in some of the towns we pass through, most have been kept up and look great! Tomorrow we head for Kerang.